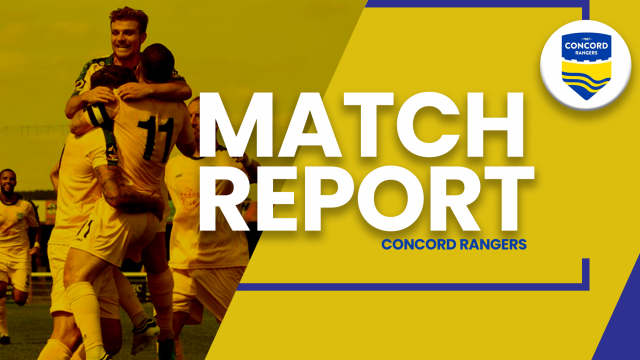 Concord complete a ugly win over visiting Rams in horrendous conditions to progress to the 4th qualifying round of the FA Cup. Jack Midson continued his fine form in the famous cup competition as he put his side ahead. Latching onto a poor defensive ball he strode on to delicately chip keeper Ravan Constable. Concord could and probably should have been more comfortable at the break and were made to pay early in the second half when they equalised against the run of play. A left wing cross from Mayowa Balogun was slightly wind assisted and beat Sam Beasant hitting the net. Alex Wall played an integral part in the winning goal, holding off Balogun’s attempts to wear his shirt as he cut the ball back for the arrival of Frazer Shaw who netted from close range.